So now that you are a member of the Porsche club, you of course want to come out to one of our many driving events. RMR uses online registration motorsportreg.com for all of our events. You will need to set up an account for yourself only one time with basic information. When you go into online registration, pick the event you want to register for and follow the instructions on the screen. You can pay via credit card, online check. Payment is deferred for all events until several days before. Part of filling out your registration form is listing your car number. If you do not have a car number yet, you may contact Nancy Warren for a number prior to the event or leave it blank on the form and a temporary number will be assigned to you by the event registrar during registration. Car numbers should be put on both sides of the car. Magnetic numbers or tape, at least 8″ high. Tape is provided at the event to put the car numbers on your window or door. Car numbers are used to identify your car to corner workers and for timing. For driver’s education events, you must have your car inspected before participating in the event. Tech forms are available at meetings, events and on the web site. A Tech form is required for each track event. Tech inspection is available at several locations 10 days before each driver’s education event, or you may have your car teched by your Porsche mechanic or by a RMR/AMR driving instructor or authorized RMR/AMR tech person (you may never tech your own car). If for some reason your car fails tech, you have the remaining 10 days before the event to correct the problem. The repair will be checked at the track (no extra charge for this). If you do not have your car teched in advance, there will be a $50 fee for having your car teched at the track. The exception to this rule, is if your car is a non-street-legal trailered car, or if you live more than 30 miles from a pretech location. Bring your completed tech form to registration on the day of the event. For track cars that are not driven on the street and are trailered to the track the technical inspection form can be filled out and approved on an annual basis. A copy of the approved annual form can then be given to on-site registration at each event. At the track, there will also be a top-tech before your first time out on the track. This is a quick check to make sure you have nothing in your car – bowling and golf balls, jack points, empty beer cans (don’t laugh, all have happened). Make sure you have cleaned out your glove box, trunk, side pockets and removed floor mats if they are not attached. Filling out the tech form in advance, correctly and completely will eliminate delays at the track – more fun time driving! Ok, now you are registered for the event. What now? 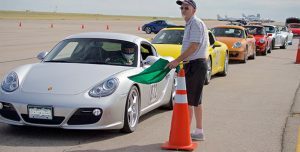 To participate in a Driver’s Ed or autocross event you must wear an approved helmet, long sleeved or short sleeved cotton shirt and cotton pants. As of January 1, 2017 PCA will only allow 2015 and 2010 Snell rated helmets at club events. RMR does have some loaner helmets. What do you have to bring? money for the food concession at HPR or lunch. Lunch for the AXs. your car tool kit, jack, etc. gasoline, be sure you have enough to complete the event. Some people don’t like to carry the extra weight of a lot of gas but be sure you have enough so you don’t run out. A half tank is usually not enough. Gas at HPR is expensive. Otherwise have to go to Byers, 17 miles away, to get gas. something to hold all this stuff, a plastic container with a snap on top is good for this. You can leave all of your track stuff in it, always have it handy and not have to worry about forgetting something. You may also use this for things you must remove from your car during the event (see top-tech notes above). The track opens 5:00 PM the Friday night before. Be early…Registration and tech at the track open at 7:00 AM. Don’t get there just in time for the drivers meeting and expect to get things set up and organized before your run group or corner working session. When you arrive you at the track both drivers and passengers need to sign a waiver and get a track wrist band. If you are bringing a minor(s) a waiver needs to be filled out and signed by both parents. Proceed to the paddock area and find a place to park your car. Pick a place close by a friend who can give you pointers and help you as the day goes on. Take all loose items out of your car. This means everything! Empty the glove box, the trunk, the door pockets, remove the radar detector, the cellular phone, tapes, CDs, floor mats anything loose. Place them in the plastic containers you brought to protect them from the elements. You may also want to remove the spare tire and jack to save a little more weight. Put your car numbers on the car. If you have magnetic or sticky numbers place them on the doors. If you are using tape put the numbers on the side doors or rear side windows on both sides of the car and make them as large as possible. Check in at registration. Bring your pre-tech form and driver’s license to registration. There you will receive your registration packet. You will need to print out the schedule and the run groups before you come to the track. The event registrar will send that information to you before the event. If you did not have your car inspected you will have to have it teched at the track and pay a fee (at which time you will receive your white tech inspection dot. At registration you will receive a driver’s wrist band which goes on your left wrist and your windshield sticker which has your name, run group, car information and car #. If applicable your instructor’s name will also be on the windshield sticker. You need to put the windshield sticker on the driver’s side of the outside windshield up high. There will be a top tech inspection of your car and equipment when you stage for your first run session. The inspector will check to be sure there are no loose items in the car, both inside and under the hood. Your helmet will also be checked to be sure it is the proper SNELL rating. After successfully completing the top tech the inspector will place a check mark on your white dot. Now, relax, check your oil, tire pressure, lug nut torque, have a cup of coffee and socialize a bit. There will be a driver’s meeting prior to the event. At the meeting you will be given information about the track, any special considerations, how the flags are to be used, etc. DRIVERS MEETINGS AT ALL EVENTS ARE MANDATORY. IF YOU DO NOT ATTEND THE DRIVERS MEETING, DO NOT PLAN TO DRIVE IN THE EVENT. After the drivers meeting there may be a meeting for novices and first time drivers at a particular track to explain the track and driving line in detail, further explain safety considerations and allow you to ask questions. Take this opportunity to ask about anything you don’t understand. Line up instructor(s) for your driving sessions (often they will be assigned at the drivers meeting). Arrange when and where you will meet your instructor for your driving session. Check the schedule, make sure you know when your group starts. Go to the bathroom. Be sure to get to the grid area on time – listen for announcements on the PA system for your driving session staging time, and your corner worker assignment reporting time. After you complete your run session be sure to properly cool down your car. Don’t set your parking brake because really hot brakes may cause them to seize and be difficult or impossible to release.